LawMate had done it again with the next generation PV-500HDW Wi-Fi enabled pocket digital video recorder and the new generation 1080p resolution button camera kit! You no longer need a screen on your portable pocket DVR because this new generation LawMate DVR is WiFi enabled. You can instantly watch and download the all important video evidence you just took to your smartphone! No wires are needed. This new generation state-of-the-art covert video recording studio will work with both Windows and Apple OS systems! 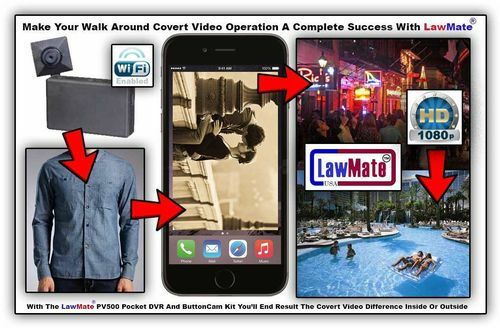 On top of that, you can use the new 1080p covert video LawMate camera as a stationary covert video camera and record all the legal covert video evidence you need quickly and easily then simply download the evidence to your smartphone or tablet without touching the unit itself. Join the new covert video revolution with features like no one else can match! You'll touch, see, feel and end result the covert video difference! 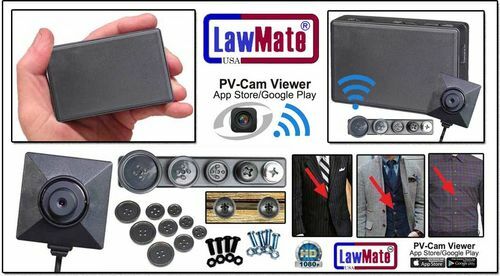 Our Lawmate Micro WiFi Digital Spy Camera/DVR w/Button Kit allow for Live Video streaming to a mobile device wither direct up to 50 feet or can even be set up to stream worldwide through the app configuration.